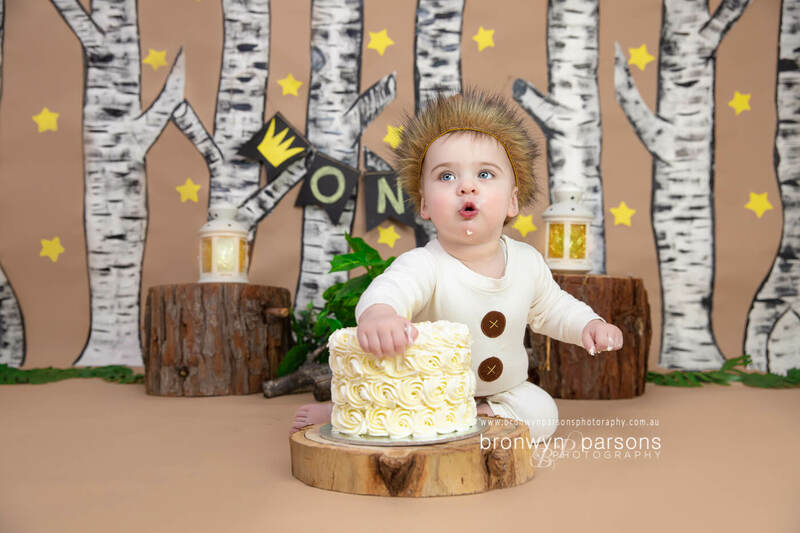 Bronwyn Parsons Photography offers Canberra indoor studio cake smash photography and outdoor rustic cake smash photography sessions. Cake smash photography is a wonderful way to remember baby's 1st birthday in or around the canberra area. Rustic Cake Smash sessions are held outdoors in a beautiful location in the first two hours or last two hours of soft natural light. We bring onsite a rustic themed set-up consisting on two natural tree stumps, a crate to sit the cake on, lanterns, bunting and natural foliage to style. Rustic cake smash sessions are inclusive of a standard round buttercream smash cake and warm bubble bath at the end. Sessions average up to 1.5 hours and include a photo of your immediate family with the birthday person, pre-smash portraits, portraits of your child exploring and demolishing the cake and portraits of your child enjoying a splash and play in the great outdoors. We provide clients a full service experience ensuring you are fully prepared in advance of the session. Clients receive a comprehensive session guide, pre-production questionnaire to personalize the session, a pre-session consultation and ongoing communication with us from start to finish. Studio cake smash sessions come with pre-set inclusions and are held in our Kambah studio. We provide a basic round buttercream smash cake, balloons, set backdrops, balloons and a warm bubble bath at the end. 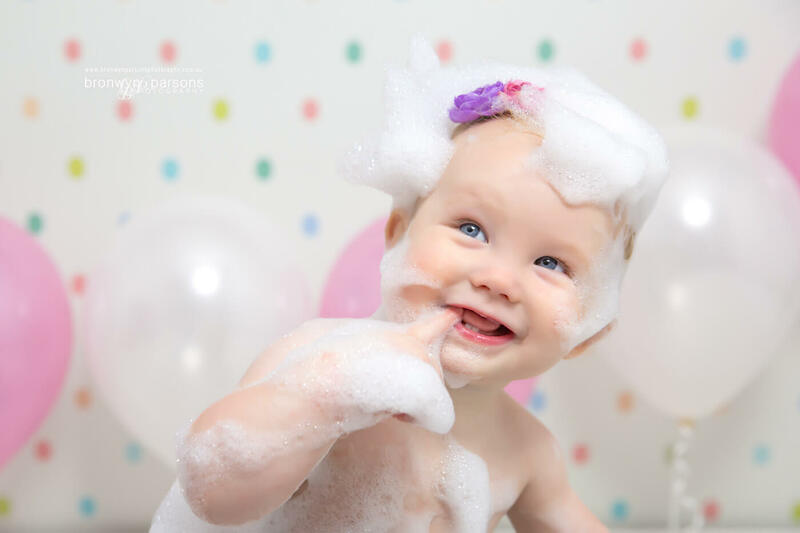 Sessions typically take between 1 - 1.5 hours (with breaks as needed) and include pre-smash portraits, portraits of your child exploring and demolishing the cake and portraits of your child enjoying a warm bubble bath We provide clients a full service experience ensuring you are fully prepared in advance of the session. Clients receive a comprehensive session guide, pre-production questionnaire to personalize the session, a pre-session consultation and ongoing communication with us from start to finish. Clients are welcome to provide any other desired decorations to include in the set-up in advance of the session date. Let us design the cake smash of your dreams. We determine your theme, colours, backdrop, props, outfits, decorations and style of cake at an initial in person design consultation. We prepare a quote for your approval, source everything, set it all up, photograph it and deliver you a selection of beautiful images to choose from. This is definitely something you will want to have professionally printed and a complimentary in person viewing, print consultation and ordering appointment is extended to clients wishing to invest in the high end printed products. Designer cake smash sessions are held in our Kambah studio and typically take around 1 - 1.5 hours. A complimentary family mini session with the birthday person takes place in a nearby outdoor location prior to the session. We provide pre-smash photography of the birthday person, photograph the birthday person in action and provide a warm bubble bath at the end to wash it all off. We ensure you are fully prepared for the session by providing an initial design consultation, session guide, pre-session consultation and an expanded level of communication from start to finish. We are one of Canberra’s best all-inclusive cake smash photographers. Choose just the essentials, something in between or indulge in the ultimate full service designer cake smash experience. Bronwyn Parsons Photography operates by appointment only. Our calendar typically books 3 months in advance. To avoid disappointment, we recommend pre-booking in advance of your preferred session date. From time to time, we do have last minute openings and welcome you to contact us to be placed on a wait list if you require a last minute booking. Session Fee (Rustic Cake Smash): $180. The session fee is payment for a set standard cake smash cake, use of set props, the photographer’s time in consulting with you, planning, organizing, collecting items, transporting items, setting-up, packing away, cleaning-up and the photographers time at the session itself. It does not include any digital or printed products. Session Fee (Studio Cake Smash): $235. The session fee is payment for a set standard cake smash cake, balloons and the portion of backdrop consumed during your session. The session fee is payment for the photographer’s time in consulting with you, planning, organizing, the photographers time and travel collecting items, setting-up, cleaning-up and the photographers time during the session itself. It does not include any digital or printed products. Want to see more? Check Out our Cake Smash Photography Portfolio to see examples of our current work.